For years, undergrads have griped about cinder block dorm rooms and a lack of space. That may be changing soon - very soon. NEW YORK (CNNMoney.com) -- Solar-powered showers, biometric root beer dispensers and waterless urinals. The dorms of the future are already here. In recent years a number of schools across the country, from large public universities to private institutions, have begun to rethink and revamp the current face of the college campus. 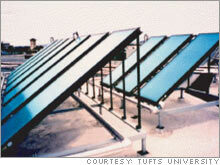 Mounted on the roof of Tufts University's new Sophia Gordon Hall will be a row of solar panels that will help provide hot water. Though many of its technological features are still in the development stage, the Duke University SmartHouse may at some point feature voice-recognition technology that could control lights, temperature and a centralized music library. One of the highlights of South Carolina's 'green' West Quad is a five-kilowatt hydrogen fuel cell which provides a portion of the electricity required for its 500 student residents. "The old dorms with cinder block walls are a thing of the past," says William Rawn, whose architecture firm William Rawn Associates has worked on residence halls for a number of universities located in the Northeast. 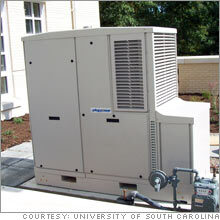 In 2004, the University of South Carolina opened its $31 million West Quad dormitories, which are partially powered by a hydrogen fuel cell and boast turf roofs that serve as natural insulators. And this fall Tufts University will officially open Sophia Gordon Hall, a dorm which will feature solar panels that preheat the building's hot water and one waterless urinal in the men's public bathroom which relies on chemical cartridges instead of running water. Most of the dorms currently found on college campuses were constructed after World War II and up until the 1970s as universities attempted to respond to swelling enrollment numbers. Schools responded by building "super dorms," which could house hundreds of undergrads, but would lead to the unmistakable signs of modern college life such as cinder block walls, twin beds and low wattage lighting that students have come to despise. One particular group, Association of College and University Housing Officers International is making push to change that with an initiative called the 21st Century Project. Earlier this year it polled everyone from students to architects to administrators in order to rethink the current college housing experience. While the summit arrived at no specific answers, some attendees floated a number of ideas such as allowing students to alter their room color by turning a knob or having dorm furniture that could be stowed into the wall or floor when not in use. "Some of this technology is out there, it just has never been put into this kind of application," explains Michael Coakley, the director of the 21st Century Project. 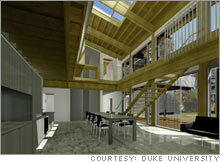 By 2012, the group hopes to have a dorm prototype built on a U.S. college campus with some of these technologies included. Next year, Duke University will open one of the more ambitious dorm projects to date, with its SmartHouse, a 4,500 square-foot dorm operated by the its engineering school that will feature projects that its own students cooked up. Besides being incredibly energy efficient, the house will feature what it calls Smart Tap technology, which is basically a soda fountain that relies on fingerprint recognition technology and solar panels that track the sun's movement. One of the dozens of other student projects that might be incorporated into the Duke dorm is Query by Humming, where a student can enter a room, hum a melody, have the home computer recognize the song and play the original from a library of MP3s, says Tom Rose, the director of the SmartHouse project which began back in 2003. But maybe more importantly, the interior of the 10-person dorm will be flexible so that old technology features can be swapped out and new items introduced. "The number one design criteria was adaptability," says Rose. "We didn't want to build a house that 'smart' on day one and dumb five years later." But improving residential life on college campuses is not just about students. The universities often have their own interests in mind. Buildings with sustainable or green technology can save a university 20 to 50 percent off their energy bill after heating, cooling and lighting thousands of dorm rooms, according the U.S. Green Building Council. Duke's SmartHouse, for example, only uses one half of the energy that a house of comparable size might use over the course of a year. But these hi-tech and green dorms also serve a greater purpose - they help sell the university to prospective students and can dissuade upperclassmen from abandoning the dorm for an off-campus apartment. "I think institutions have really woken up to the fact that students are their market and they have to appeal to that market," says Jim Curtin, a senior vice-president at the Chicago-based architecture firm Solomon Cordwell Buenz and Associates, who participated in the 21st Century Project summit. But schools also know that as the higher education environment adjusts to new technologies, the dorms can still play a vital role as a community building catalyst on campus, which may not always be the case with the cinder block "super dorms", says architect William Rawn. "Too many schools are just feeling they need more and more dorm beds and are building new buildings at the far end of campus with no sense of how that adds to community," he says. "It's an important issue that every college has to deal with."